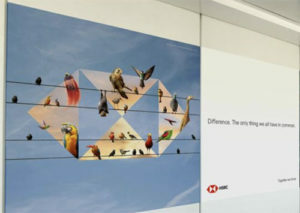 HSBC revamped its airport advertising strategy last summer. Airports are a period of “still time” for business travelers, making advertising there a key opportunity for B2B brands to connect, according to a new report. 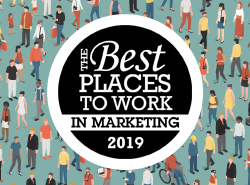 Ninety-five percent of senior and c-suite execs say flying is an integral part of their job roles, according to the survey by data intelligence firm Future Thinking and outdoor advertising company JCDecaux. 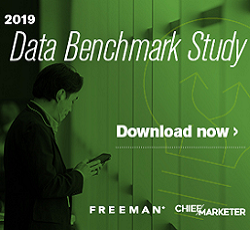 Four out of five execs surveyed said they are likely to consider a B2B brand after seeing advertising at the airport, and nine out of 10 said they had taken action after seeing a B2B ad before or after a flight. “A combination of frequent travel, work-mode mindset and positive sub-conscious associations coupled with an interest in their surroundings means the airport is a very conducive environment for any B2B brand to connect and engage with the key audience of [decision makers],” noted the report. The report surveyed 4,464 decision makers with budget responsibility in the fall of 2018 in 12 countries. With the help of agency Saatchi & Saatchi HSBC refreshed its creative in 17 airports around the world last summer; the approach varied depending on whether the terminals were considered leisure or B2B hubs of travel. “Depending on your locality, some local markets have chosen a different blend, on top of their executions. There are about 80 different versions. We are encouraging them to refresh that and change that up more often than they have done in the past,” says Cutts. “We have had a revolving program of updating imagery across the airports but we have never done them all at the same time. Outside the airport, HSBC recently worked with French composer Jean-Michel Jarre to create a series of compositions that could be used for everything from mobile apps to on-hold call center music. Hamish Goulding, HSBC’s head of global brand strategy and creative, noted at a recent World Media Group event that the music could be used to create an audio/visual identity for the brand, and create an emotional bond. “We needed a soundtrack to the HSBC experience, he says.